Family owned & operated. Our park is beautifully landscaped with paved roads. All the finest amenities including free Wi-Fi, sparkling restrooms & showers & a great BBQ dinner. Pet friendly. Active duty military stay free. A nice place right on Route 66! Cheerfully greeted, and promptly assigned a space. Bathroom facility metro exceeded my tough standards. Staff is busy getting all of the nice amenities, the waterfall/pond, barbecue restaurant and general park condition out of its winterization state and ready for the spring and summer camping season. Nice gift shop if you need something last minute to take home to friends. Great respect is given to military members as they offer those who are currently serving free stays and a great discount for veterans who can show proof of service. And the free coffee in the morning is great! Thanks for a great sty and we’ll be back this June! We have stayed on two different occasions. Both times where good overnight stops. I have read all of the reviews up to this point and cannot understand what the negative ones are talking about. I like to have a fair description when I am using the reviews to try to pick my campground selections. I sometimes feel like some people review based only on personal preferences and not willing to objectively review so it can give the reader an accurate description of the park. We have a 40 ft Motorhome and fit just fine and everything was good. We stayed in our 41 foot fifth wheel for one night. The gentleman checking me in was friendly, the restrooms and showers were very clean, the campsites were gravel and good size. We didn't see much of the town and would recommend this for a one night stop. Stayed in September in 35' class A with toad. Site was the last row and was kind-of a pull through. We are not early risers so we could actually pull through. This was an odd stop for us. I don't know if it was the park or the surrounding town, but it was uncomfortable. Park has a number on long terms, it was quiet, hookups were OK, no cable on last row. Pet area is dirt only and not pleasant. Pulled in late and did not take advantage of the BBQ - it was all just kinda weird. 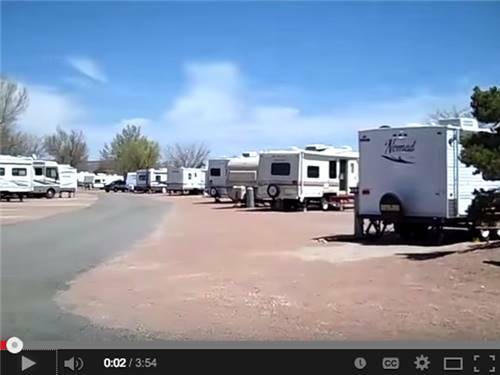 This RV park is no more than a large gravel parking lot with full hook-ups. The picnic tables are falling apart, the pool needs a lot of work, for the number of spaces they have there were only 3 washers and one was broke during our two-day stay. They advertise free wi-fi however it depends on where your space is whether or not you will be able to connect. If for some chance you do get connected you may not get internet. I had to use my data so advertising free wi-fi is a false statement. They have supposedly a cowboy dinner however that was canceled both nights we were there. The area they have the dinner is not an environment that I would be comfortable eating in, and the help is not friendly. The store is nice for unique gifts, however, don't expect that you will be able to buy simple food products. They had very little. If you have to stay here for an overnight rest to continue on your trip that is all I would recommend. We travel a lot and decided to rest for 2 nights prior to continuing on our cross-country trip. I would not recommend this place other than a very short overnight rest area. Great stop during our cross country RV trip. This was a laundry stop and the facility was nice and clean. The sites were a bit close together. but very clean and well maintained. there was a BBQ dinner available and a heated pool. 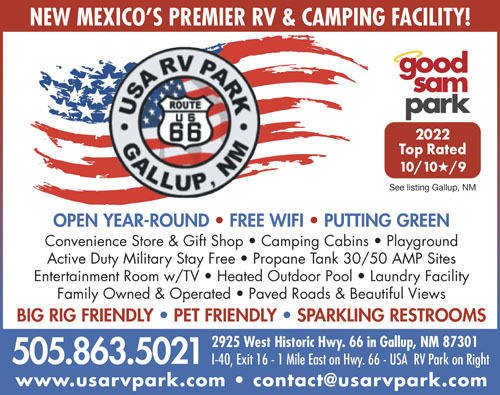 If you are going across New Mexico this is a great place to rest for the night or a good base camp to explore the Navajo Nation. We stayed here overnight while traveling along I 40. The park is very convenient to I 40. The entrance is quite impressive, with interesting art work. We did not use the restrooms, pool (not open yet) or play area. Once you get past the entrance, the park becomes a large over crowded parking lot with full hook ups. Spaces are quite close to each other and it is all gravel. They did make it very easy to access sewer hookup, as there were several hook ups along the side of our site. The security here was very good. Hubby went for a walk at night to shoot pictures of the entrance and art work and was stopped and questioned. I appreciate that. It seemed as if a lot of the business here was people spending the night. When we arrived the park was fairly open, but as the afternoon progressed, the place filled up. All you could see out your window was the RV next to you. I would stay here again, if passing thru for one night. It was clean and well managed. We really enjoyed our overnight stay. Everything was clean and quiet and as a bonus they were serving pulled pork sandwiches for dinner. The sandwiches were very good! I would stay here again and recommend it to others. Busy place but we were processed quickly at 8pm. We just stayed one night. Well planned layout. Easy in and out without having to unhook the toad. Every place in Gallup is close to the trains - but I did not hear anything until early morning (about 7am). My site was level (in fact, the entire campground looked very flat). If you are going to spend more than one night in Gallup, this is the place to stay - a little ways away from the noise of town. Close to gas stations and the Interstate, but far enough away to not be bothered by either (I did not hear any truck noise). The entire campground was very clean the night we stayed there. My only problem was that the sewer hook-up did not have threads and no rock around to hold my drain pip in place. I will stay here every time I spend the night on Gallup. This is not a "fancy resort" but was better than the "resort" in Phoenix where we spent a week. On our way east on I-40, we stayed here for one night. Plenty of room for our 25' class C with towed car. Park was pretty empty, first week of November. Roads and sites are gravel. Big dog park was gravel. Wi-fi was okay as we were close to the laundry. Far enough off I-40 on old route 66 that we didn't hear any noise inside our MH. We had FHU and no problems. We were in site 3. I asked one of the girls in the office about the lack of grassy area in the dog park. She said that because the Fall is their dry season, the city has watering restrictions and they are not allowed to use water for that. This seems to pretty much be the case in NM and AZ during this time of year. We heard a little noise from the BNSF railroad outside our MH, but none inside. We live in an area that is one of the approach paths to Nashville Airport, so this was no big deal. Walmart and other stores are next exit east (EXIT 20). WARNING: If you go east on I-40 to Walmart and then take Mahoney Ave. west and turn left (south) to go Alison Rd. to head west on old route 66 THERE IS A POTENTIAL PROBLEM WITH A LOW RAILROAD OVERPASS ON ALISON RD. CLEARANCE IS 13 FT 2 IN. We did not have a problem, but other's might depending on your RV's height. If height is a problem, just get back on I-40 west to exit 16 for the campground. Made me nervous as soon as I turned left and saw it, but our MH needs 12 feet, so we were okay. We spent a week at USA RV Park over Christmas visiting our Grand kids. The park is very well maintained and the staff helpful and pleasant. The bathrooms and showers were kept very clean and were well heated. We had one night that got down close to 0 and had no issues. The dog run is at the back of the park which is good for the other campers. The spaces are relatively large and leveled with gravel. When I set up I only had to level front to rear. The water is all heated with heat tape to prevent freeze ups. It is quiet with the exception of a few private planes that take off and land at the Gallup airport. The noise isn't enough to be concerned with. The BNSF main line is across 66 from the park and you can hear the trains, but as there is no grade crossing close there are no horns heard. It's really nice for those like myself who are railfans. I have read some reviews that complained about the turn from the west into the park. Their is no problem with the turn as the driveway is plenty wide to make the turn. I pull a 36' fiver and the turn was easy. I plan on staying many more times as we try to visit the Grand kids as often as we can. One week of camping cost less than three days staying at the local La Quinta. Driveway entrance is angled to one side - be aware as you come from west. Sites are all chattahoochee size rocks and parked front to rear. I was worried our slides would hit, we are that close. We can hear the traffic but that's to be expected. The airport runway ends at the park so small planes fly over but we enjoy that. We are one night only and I don't think I would enjoy longer, just feels too close. We thoroughly enjoyed our stay at this park, the Route 66 set up was very unique. The staff was very helpful and friendly. Highly recommend this RV park. Well maintained. Restrooms are clean and kept up. Seasonal B-B-Q in the evening (worth purchasing). Staff is very helpful. Will put this Park on our 'will stop again' list. This truly pleasant place to stay. The staff was so nice. One of the daughters ck'd us in and was so sweet. They had a cook out that night and we were able to order a full BBQ dinner or just sides. We already had our dinner planned so just took advantage of the sides. The park was decorated very nice and we thoroughly enjoyed or stay there. Easy pull thru sites on level gravel. Well maintained. Will definitely make this a stopping place in the future. Keep in mind that they will charge you for kids that are with you and charge for cable if you want it. Other than that everything is real clean and nice. Clean, welcoming staff, nice laundry facility and pool. The staff is very friendly and helpful here. The sites are level, the facilities are clean. They have a nightly BBQ, which is a good deal and delicious. It's also a nice way to meet other campers. Wifi has a strong signal. The cable never worked for me. There isn't a lot to see here, unless you are interested in buying Indian jewelry or rugs. Nice park, but no grass for dogs. Wi-Fi worked good. Would stay here again. We reserved this park based on the rating by Good Sam. Upon arrival we walked into the office to pay and get our assigned site. It was at that time we were advised the pool was unavailable. I inquired as to why the pool was unavailable and was told it was not opened until Memorial Day because they DO NOT want to heat the pool due to the nights still being a bit too cold and it’s too expensive. Well, one of the reasons we booked this park was because of the pool being heated as the website leads EVERYONE to believe. The website “baits” you with several amenities including the heated pool and random security patrols. In the week we stayed we NEVER saw a security patrol. During the day we did see someone drive around on a golf cart but that was fast and to a site and back to the office. As we checked in, the clerk spoke excitedly about the BBQ. In our packet we received a flyer about the world famous BBQ. Well we discovered the “cowboy Cookout” is nothing more than a person in the back office opening an ice chest (we saw that) and would put some pulled pork sandwiches together. We also inquired about the game room, club room or card room. We were told that room is now an attic full of storage and not used. We traveled 89 miles to get to the park to take a week off to relax. Had we known the pool was unavailable, there was no club room, the website was completely misleading and their cowboy cookout was nothing more than a pulled pork sandwich out of an ice chest, we would have gone another 130 miles down the round to a real RV Park. Nowhere does the website mention or when talking to a person for reservations is it mentioned that the pool does not open up until Memorial Day and that a club room was not available. Other then what was mentioned the park as a whole is nice and really has potential. It looks like an old KOA. The sites are level with gravel and well maintained. Water pressure is good and power at the pole is good. I believe they should adjust the website to reflect everything that is not available, including the pool, a club room and that there is not a cowboy cookout before Memorial Day or at least inform the caller making reservations that if you arrive before Memorial Day pretty much everything on the website is wrong. Apparently there is no adjustment in price for the lack of amenities advertised. I would recommend this park for an overnight stay ONLY because it’s about all there is out here. Other than that, I would recommend driving the 135 miles to Albuquerque and stay elsewhere. This is an amazing park. Extremely well run and very reasonable. Did not use their restrooms or laundry services, so cannot comment on that. Very nice park with good size sites. The only real problem was the aircraft noise - airport really nearby - and the train noise - almost every hour all night. If you are not sensitive to noise, a really nice place. Just stayed one night. They were friendly, organized and efficient. Pull through spaces were excellent - gravel base and almost perfectly level. Park is well laid out. Spaces are a little close but there was still plenty of room for slides. They are close to railroad track and small airport - husband said he heard trains and planes during the night - I heard nothing and slept great. They also have a great BBQ cafe right on site. We had pulled pork sandwiches and they were excellent. We wound up eating there and didn't bother unhitching our toad at all. Pretty nice gift shop in the office but a little pricey for us - seems normal for this area. Highly recommend this park! I gave a 4 star only because the dog run was gravel, grounds had no grass and heard small aircrafts as early as 2am on. They sounded like they were flying right over us. After 700 miles of travel we pull in and are given site #8 which is about as far away from the pet area as you can get. I requested a site closer to the pet area and was given site #54. We drive to that site and it is taken. We go back to the office and are given site #31. We drive to that site and it is taken. We drive back to the office and are put back in site #8. Site #8 is exactly across from their 5:30-8:30 BBQ and pool. It is door to door with the trailer on our right. It is very far from the pet area. It is all gravel, no trees and unattractive. I am hard pressed to fathom the 10 ratings on this park. The sites are narrow and door to door. I am facing the dump station. I will not stay here again. I was in tears by the time I got parked and feel I was treated poorly. Side note for people with fur babies. The dog park is all gravel, hot gravel..there is not a blade of grass to be found except near the BBQ area. Ranks up there with my LEAST favorite RV park in 12 years of RV'ing. We checked in and were greeted with a friendly staff. They were very informative and made the check in process simple. The facility has a lot to offer. Nice pool, Beautiful waterfall, put put and huge outside chess. Great onsite store with everything from food , tools & souvenirs. There is a nightly BBQ and ice cream social. Sights were easy to pull into and hook up. WIFI was great. I would highly recommend this to anyone thinking about stopping. Stayed 2 nights due to day trip to Canyon de Chelley. I agree with most of the reviews, nice spacious RV park, clean restrooms and showers. WiFi is spotty as most RV parks are, that's the only knock. BBQ was great even included entertainment. Would definitely stay here again. Very nice park. Friendly and helpful staff. Hookups were well laid out. Most lots are facing each other so if you are travelling with another RV you face each other. Excellent Bar-B-Que dinner served every night for around $10.00. Would definitely stay again. Attractive and well maintained. Located about 1 mile from I-40. Management is friendly and helpful. Restrooms are large and very clean. Weakness is that sites are pretty close together. Almost no trees or grass. Did not get to try the BBQ; their restaurant is closed on Sunday. Stayed in a 45 ft. motorhome. Easy in/out ... no road obstructions. Level site. Wifi inconsistent. Not much to do in Gallup but campground good for overnight. Very clean showers/bathrooms. My wife and I stayed stayed at USA RV Park for 2 nights. The park is easy to get in and out. The pads are level and spacious. We have a 27' pull behind with slide out, and did not have any troubles setting up. The people that operate the park are friendly. Bathrooms were well maintained and clean along with the showers. It is a dog friendly park with access to the range land next door. Unfortunately the restaurant was closed for the winter. It is a quiet park with little traffic noise from the road. Be cautious when listening to your GPS, that it gave us incorrect directions to this park. We would stay at this park again if ever in the neighborhood. Very nice owner and RV Park. I'm retired Navy, so they gave me a extra 10% discount on top of the Good Sam 10%. I will stay there again on my way thru. 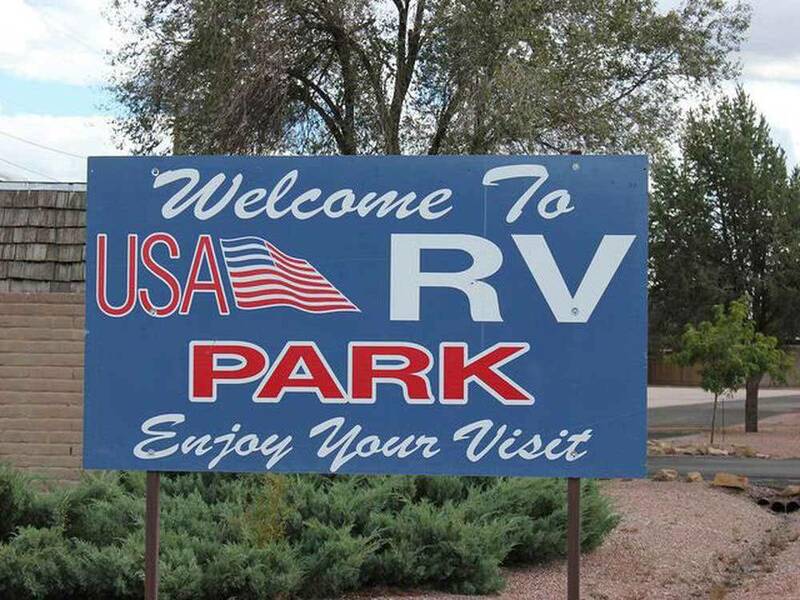 I can only say that Usa rv park is one of the nicest, cleanest and friendliest parks that I have ever stayed at. If I ever get back to Gallup, I will certainly stay there again. They also have great rates. Nice park, easy parking. Only complaint is the electric is in the middle of the site and our power plug is at the very back end of our rig, so made us have to move more forward in the site than we wanted to. They gave us a military discount and the person in the office was very pleasant. Easy Access, Well maintained, great facilities and the BBQ was fabulous. Would definitely recommend. Absolutely gorgeous RV park! Level and spacious sites. Great pool. Be sure and have dinner at the park's world famous BBQ restaurant. Very friendly accommodating park staff. A real jewel in Gallup. Experience the beauty & culture of Gallup, NM in the heart of Indian Country. Just a short distance from national & tribal parks like Mesa Verde, El Morro, Window Rock, Zuni, Four Corners, Monument Valley & Painted Desert. From jct of I-40 & exit 16 (Historic Route 66/W US Hwy 66/Hwy 118/Bus Loop 40): Go 1 mi E on W US Hwy 66/Hwy 118/Bus Loop 40 (R) Note: don't rely solely on GPS.